Edit: I’ve updated afterPCA function to work with input of any dimensions. 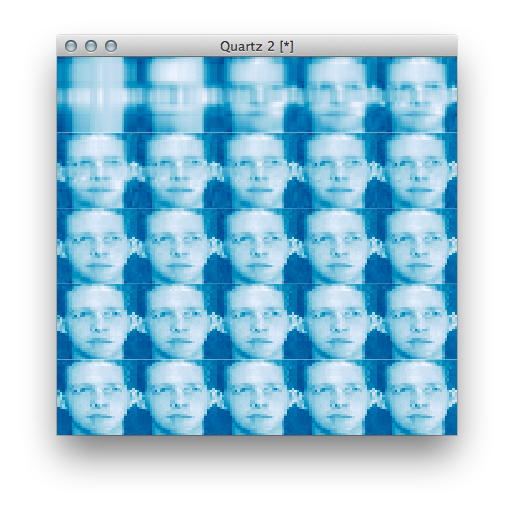 Previously it only generated correct output for square matrices. PCA is widely used method for finding patterns in high-dimensional data. Whether you use it to compress large matrix or to remove one of the principal components in biological datasets, you’ll end up with the task of performing series of equations from linear algebra to reconstruct the matrix of original dimensions. To find principal components, we first need to center the input matrix, and then calculate the eigenvalues and eigenvectors of its covariance matrix. To illustrate matrix reconstruction I’ll use 32×32 faceData matrix from Jeff Leek’s coursera course on data analysis. First thing after doing PCA is to check the contributions of each PC in explaining the variance. 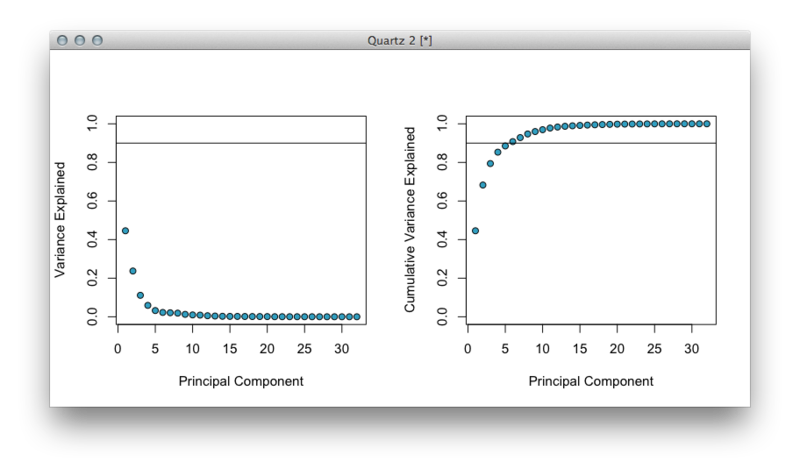 From these plots you can see that faceData has ~5 PC’s that cumulatively explain ~90% of total variance. Lets use this information to reconstruct the matrix, and compare it to the original one. 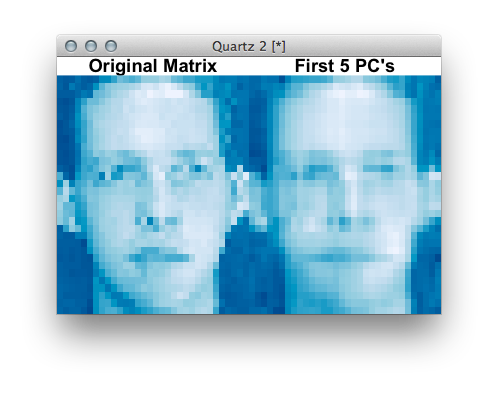 As seen from eigenvalues (variances), taking only 5/32 PC’s is enough to recreate face that has almost all of the features of the original matrix. 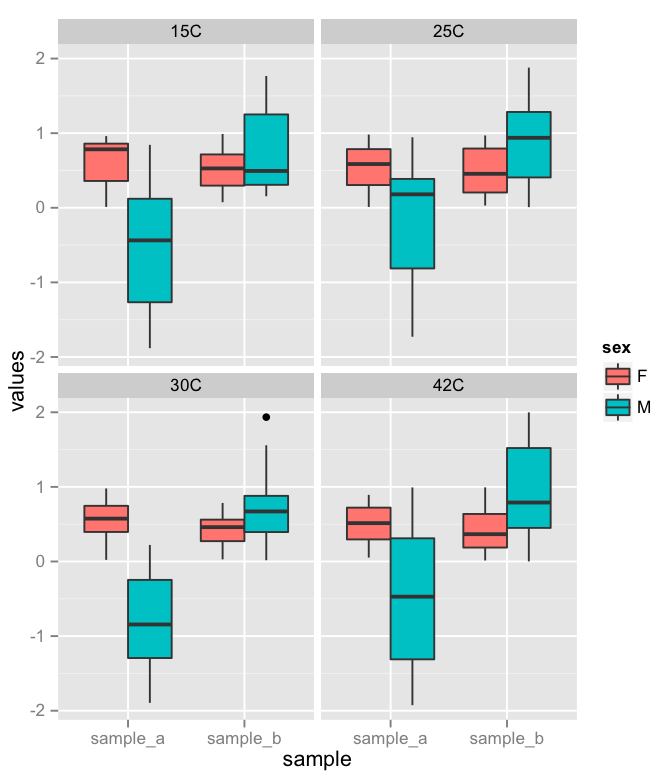 Recently I was asked for an advice of how to plot values with an additional attached condition separating the boxplots. 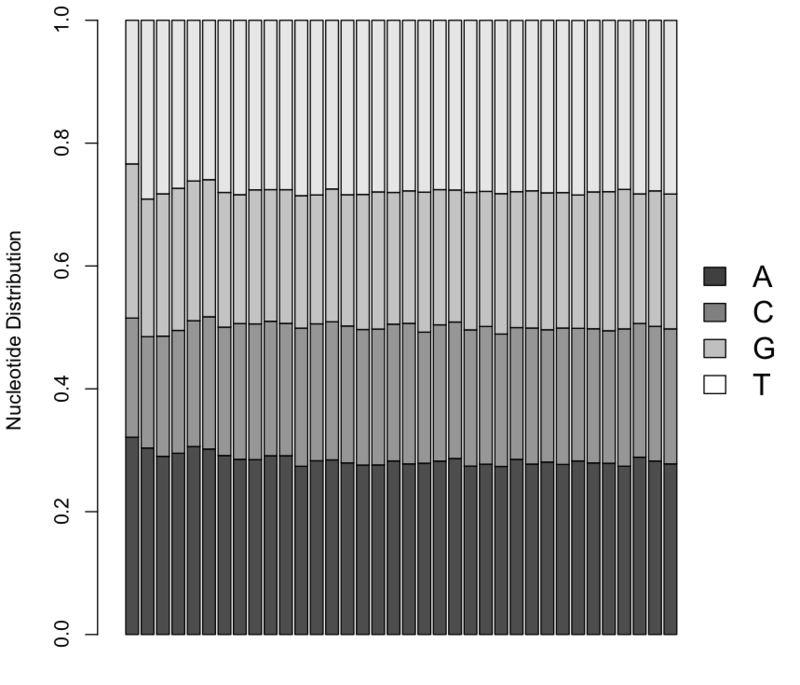 This turns out to be ugly in base graphics, but amazingly simple in ggplot2. One of the most popular posts on this blog is the very first one, solving the issue of mapping certain ranges of values to particular colors in heatmaps. Given the abundance of ggplot2 usage in R plotting, I thought I’d give it a try and do similar job within the context of graphics grammar. Trick was to discretize the matrix of continuous values. Alternatively, you can use “breaks” argument in functions such as scale_fill_gradientn, but such method will assign continuous list of colors within set range. The following biological phenomenon demonstrates just how elegant R code can be. In vertebrate genomes, a methyl group (-CH3) can be added to nucleotides. Such process of methylation is commonly associated with gene suppression. Most of the cytosines in the system are methylated (apart from structures called CpG islands). If a spontaneous event of deamination (removal of amine group) occurs on cytosine, different outcomes happen depending on the methylation state. If cytosine was not methylated, it is then converted to uracil nucleotide, which is not a constituent member of DNA sequences and is quickly repaired by the system. However, if the cytosine is methylated, conversion to another nucleotide occurs – thymine. Since thymine is natural part of each DNA sequence, system cannot recognise this change. 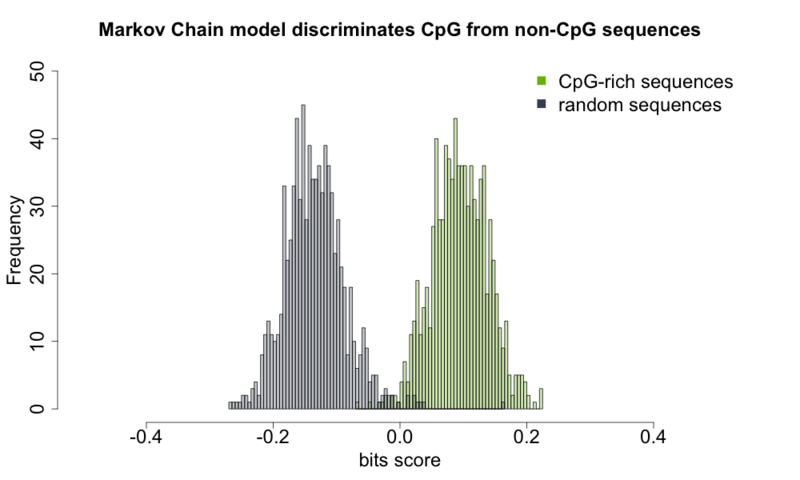 Thus in vertebrate genomes, we see much lower proportion of CpG dinucleotides than expected. It takes 2 lines of R code to discover this phenomenon. You may have also some unexpected nucleotides (>16 permutations) that contain “N”. These are the bases that could not be assigned by sequencing machine. Finally, let’s visualise CpG dinucleotide depletion. You may wonder why CpG and not GpC? 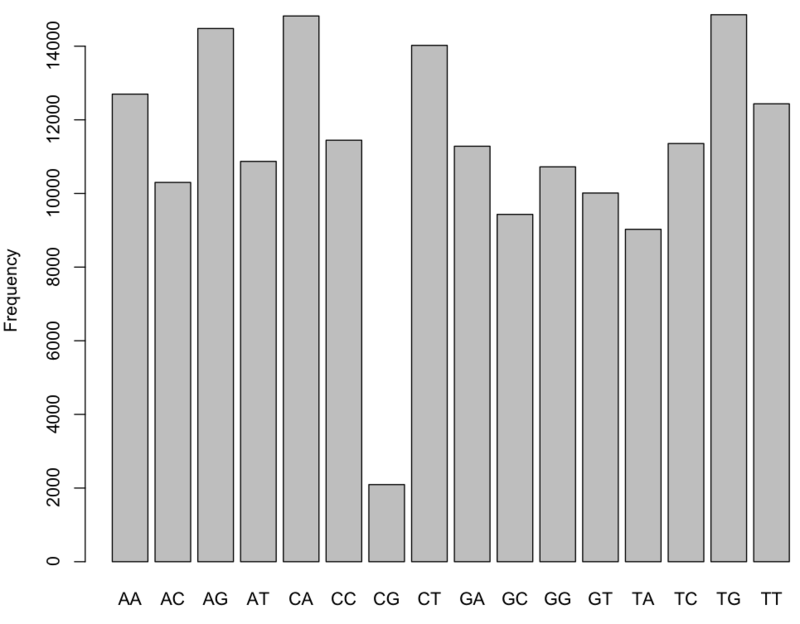 Cytosine in GpC is rarely methylated (http://www.ncbi.nlm.nih.gov/pubmed/6254144). Edit: You can find the dataset used in this example at http://goo.gl/qrL48. Original research is presented at http://dev.biologists.org/content/139/14/2625. Often scientists are interested in finding genome-wide binding site of their protein of interest. 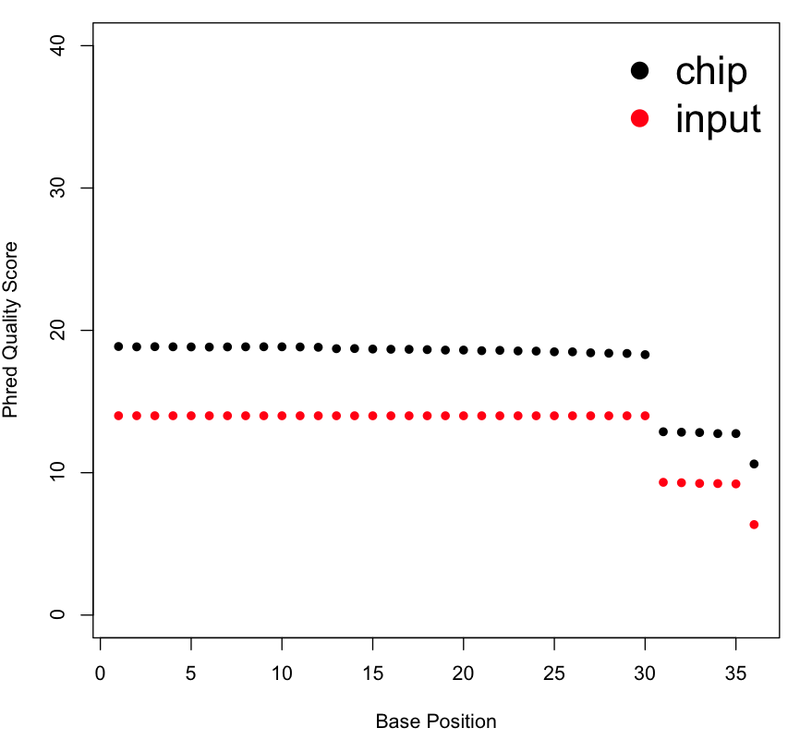 R offers easy way to load and process the sequence files coming from ChIP-seq experiment. During the next weeks I’m going to present a pipeline that uses several Bioconductor packages which contain necessary functions for working on NGS datasets. To keep blog organised, posts are going to be divided into several parts. As content is uploaded, links will be made in this summary post for easier access. So let’s start with the first topic – loading and QA of sequence reads. If you’re familiar with the faster iterations on objects such as lapply, sapply, or apply for matrices, you might get surprised that the function call saves new assignments only locally. One of my favorite lines in R comes from the fact the language environment devours the memory. To focus on particular objects (such as when you need to save it as *.rda), replace the search term within grepl function for the one that you wish to keep. Previous post presented the problem of dishonest casino that ocassionally uses loaded die. Sequence of the real states is hidden, and we are trying to figure it out just by looking at the observations (symbols). If we apply our implementation to the data in the previous post, we can get the idea how well can HMM reconstruct the real history. Example in the mentioned book goes as following – dishonest casino uses two types of dice. Fair one that has equal probability of landing on either side (1/6), and the loaded one with 50% chance for getting 6. Your task is to figure out which die has been used (states) just based on the sequence of the outcomes (symbols). Notice that we convert all probabilities in log scale. Viterbi algorithm selects the most probable path that can have very low value by the end of the run. Thus, conversion to appropriate scale helps avoid calculation issues. # we'll represent loaded die as "L", and the fair one as "F"
After we defined the model, we need to initialize two object that will keep the track of probability history and state path (Pi) during the recursion process. Often you want to set the fixed colors for particular range of your dataset to be sure that the visual output is correctly represented. This is particularly useful for time series data, where the range or your dataset might drastically change during the course of the simulation. 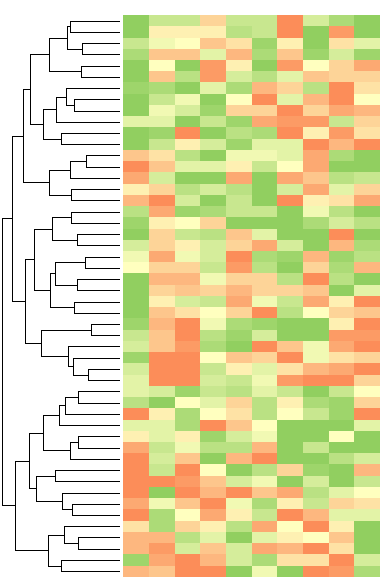 To do that in R, we need to set the “breaks” parameter in plotting functions such as image or heatmap.2.